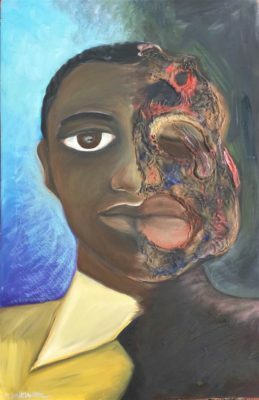 Blog Do writers and artists think about the colour of their skin or what is inside and outside it? This story made me once again question myself in relation to my own work. Must a white artist limit themselves to their own culture or their guilt and wrongdoing in relation to other cultures? Who says that this must be so? History? Culture? Society? 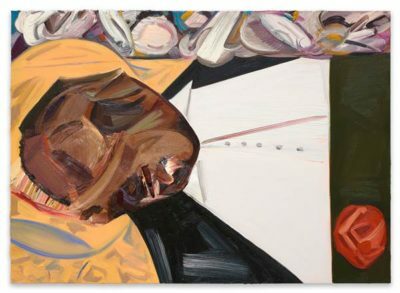 Can I explore injustice and oppression as I assume Dana Schutz intended to do, only if I have the identical experience? This post has become so interesting, complicated and long so I have decided to split it into two and carry on with the ideas it raises next week as well. I hope that you’ll want to read it and to comment on it. Next week I’ll start with the Brett Bailey Exhibit B. which you can see below. I did want to ask readers what they thought of Dr Whittington’s suggestion to Dana Schutz. Should Schutz respond as a person or as a white-skinned person? Does she have to identify as a perpetrator? Does she have to ask for forgiveness for herself or the whites who killed Emmett Till? How do Germans face up to the Holocaust or South Africans to apartheid? These are some of the questions I want the characters in my next book Hannah’s Housekeeping to face. I don’t know the answers. Racism or critique? … One of the installations in Exhibit B at the Barbican. I posted several years ago in response to a similar event that took place in London in September 2014 when a South African artist, Brett Bailey, exhibited his installation entitled Exhibit B.
I will also refer to the art made by Kaolin Thompson which caused enormous controversy and shows how easily the good intentions of inexperienced youth can be a mistake and backfire as Dana Schutz’s did. I find your post interesting, Ruth, but rather deep. As a multi-genre writer I don’t pose these questions. I simply write a story about human beings, whatever their colour, religion or race. I quite often include characters of various races, all with human traits and often with touches of humour…that’s what life is all about. During my working life in a hospital environment, I worked for many years with people of all nationalities and got to know them very well. On the whole, they became my friends and my extended family, whether they be African, Indian, Chinese or eastern European. Getting to know them taught me that there were many similarities between the races, always some interesting differences but quite often the same or similar problems. I consider myself to be a writer and therefore without prejudice, but I remember one occasion when I wrote a romantic suspense that involved a black American ex FBI agent and a white English prostitute who had turned her life around. I received a scathing review, which was a personal attack on me with no mention of the black/white situation. The reviewer’s words were: “Come on, June, what’s this all about?” I must hunt out that rejected novel one day and revamp it, get it published and hope that the reviewer of years ago recognises it. I’m sure this doesn’t answer your questions, Ruth, but I must say that as I write about people of any colour or creed, I am not aware that I am a white, protestant and the characters are not. We are just people from different backgrounds, with the same emotions making us hurt or making us happy. I think you are right June – writers should be writing about what life is about as you do. We are all the same under the skin as you say. I suppose that the culture I grew up in and the experiences that I’ve had have made me write about certain kinds of conflict and certain kinds of problems. I have also found that there is rather a lot of criticism out there as you found in that scathing review around the question of the ‘authentic’ voice. I guess I am really raising questions hoping to have a discussion because I don’t have answers. I did get a review about my book ‘The Shaping of Water’ which dismissed the story as only being about’white’ people. I wondered if she had read the book.